When and whom to test for a genetic predisposition to cancer has been confusing to both patients and many doctors. The traditionally high cost of testing (thousands of dollars), coupled with insurance companies’ reluctance to pay for testing in the general population, has led to a mystique that such testing is both unnecessary and unaffordable to most people. However, there is one group that seemingly would be ripe for such testing – an ethnic group that has ten times the chance of carrying a genetic mutation that, when present, can cause an 80% lifetime risk of breast cancer and more than a 40% lifetime risk of ovarian cancer. Furthermore, because of a genetic concept known as founder mutations, the cost of doing genetic testing in this population is about a tenth what it would normally be. 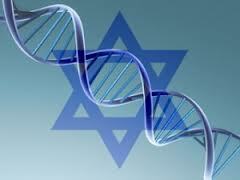 A recent study conducted in Israel has brought to public attention what some of us in the field of cancer genetic testing have been saying for years: If you are of Jewish descent, even if you don’t have a personal or family history of breast or ovarian cancer, you should consider being tested for the BRCA1 and BRCA2 founder mutations. (BRCA1 refers to the first discovered breast cancer associated gene and BRCA2 for the second such discovered gene). Yet what difference would it make, you ask? Most people’s thoughts about BRCA are focused on breast cancer risk. Understandably, many women who are fine now are reluctant to consider genetic testing and contemplate prophylactic mastectomies to prevent a breast cancer they may or may not get in the future, due to a genetic mutation. 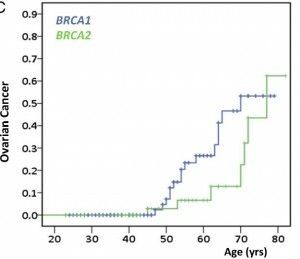 Nonetheless, BRCA women carriers have other options when it comes to reducing breast cancer risk and younger women who carry mutations should afford themselves of screening starting at age 25 with MRI as a complement to mammography. However, the even more compelling reason to be tested is the inordinately high risk of ovarian cancer in this population. 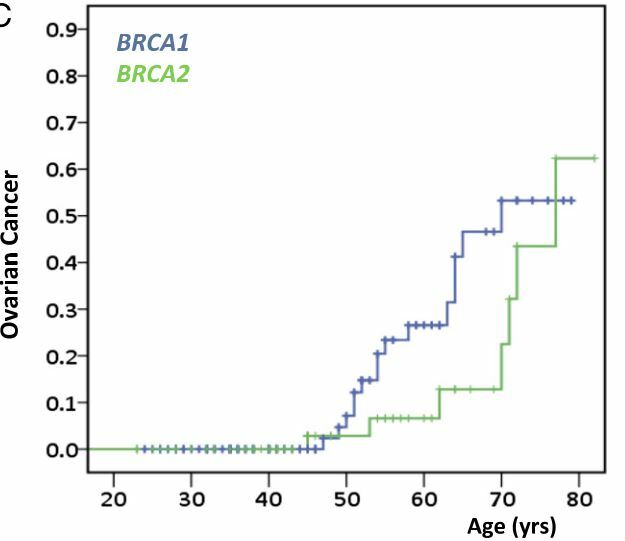 As shown above, the lifetime risk of ovarian cancer in BRCA carriers in the Israeli study was over 50% and starts to dramatically rise in their mid forties. Unfortunately, there is NO effective screening for ovarian cancer; but having one’s ovaries removed after having your family effectively prevents ovarian cancer. Today, laparoscopic or robotic removal of the ovaries is a relatively simple surgical procedure with a quick recuperation. Today we live in an age called “evidence based medicine” whereby, even if something is obvious on the face of it, one must do a study to prove it is true before it can become accepted medical practice for which insurance companies will pay. This study both provides such evidence and has increased public awareness of the benefits of cancer predisposition testing. It also opens the door to insurance companies offering universal testing of BRCA in the Jewish Ashkenazi population even when there is no known family history of breast or ovarian cancer. So, to all my friends of the Jewish faith who are in synagogue this week celebrating the coming of the Jewish New Year, take a look around. One in forty of you carries a genetic tendency that began over 2000 years ago and through both men and women has been passed down from generation to generation as are the biblical passages you are reading about. This is one case where we have the potential to alter our genetic destiny – so consider BRCA counseling and testing in the New Year to come; even if no one in your family has had breast or ovarian cancer and your insurance company is stingy. Then pen a letter to your insurance company and your benefits manager inquiring why one of the most cost-effective and life-saving tests we can offer is not routinely covered in this high risk population.